Underlying northwest Louisiana and a large portion of East Texas, the Haynesville Shale covers more than 8,000 square miles. Its depth ranges from 10,500 to 13,000 feet below the land’s surface. Geologists had long known that the Haynesville Formation contained vast quantities of natural gas. However, because of its low permeability, the Haynesville was originally considered only a source rock rather than a gas reservoir. In 2008, the successful application of horizontal drilling and hydraulic fracturing — techniques developed in the Barnett Shale field in North Texas — forever changed the Haynesville. In fact, the Haynesville Shale is now considered to be the second largest natural gas field in the United States, trailing only the Marcellus Shale with an estimated 75 trillion cubic feet of recoverable natural gas. The Haynesville Shale is a black, organic rich shale of Upper Jurassic age. Its lithologically heterogeneous mudstones vary greatly depending on the geographic location and stratigraphic position. They range from calcareous mudstone near the carbonate platforms and islands to argillaceous mudstone in areas where submarine fans prograded into the basin and diluted organic matter. 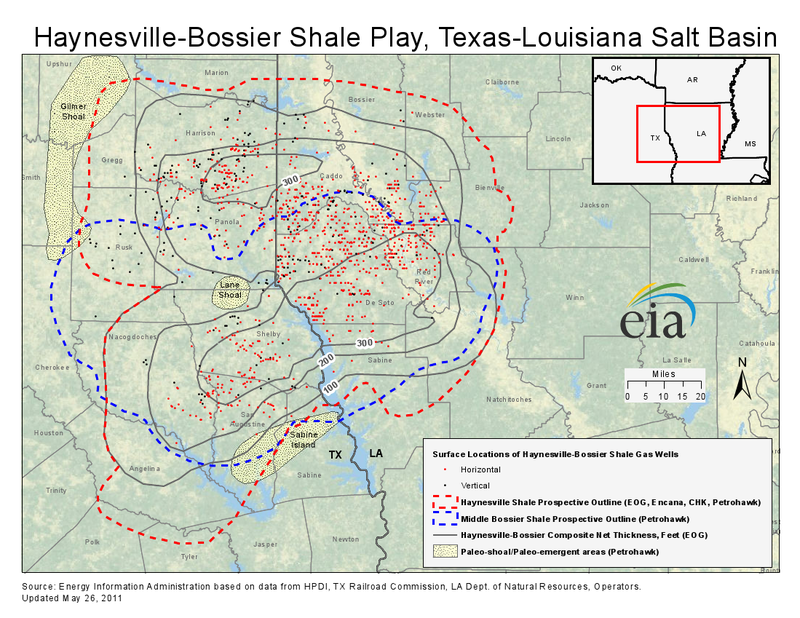 The Bossier Shale formation lies just above one-third of the Haynesville Shale. Since the two shale plays have been developed simultaneously, the play is occasionally referred to as the Haynesville-Bossier Shale Play. More than 2,400 wells have been drilled in the Haynesville since 2008. At its peak in 2010, nearly 190 drilling rigs were operating in the play. However, the success of this and other natural gas shale plays around the country pushed natural gas prices down to a level that made the play uneconomical. Few wells were drilled in 2011 and 2012 and many completed wells were shut-in. Increasing natural gas prices this year are spurring a slight resurgence in drilling. As of June 2013, the drilling rig count in the play was up to 38 rigs. With an estimated 75 percent of the natural gas reserves yet to be produced, if natural gas prices hold or increase, drilling in the Haynesville should continue for many years to come.